An arboretum is a botanical garden devoted to trees. As the Worcester Tree Initiative, we are very interested in and involved with local arboretums. This page contains info about arboretums around Worcester. If you're a tree lover, check these places out! 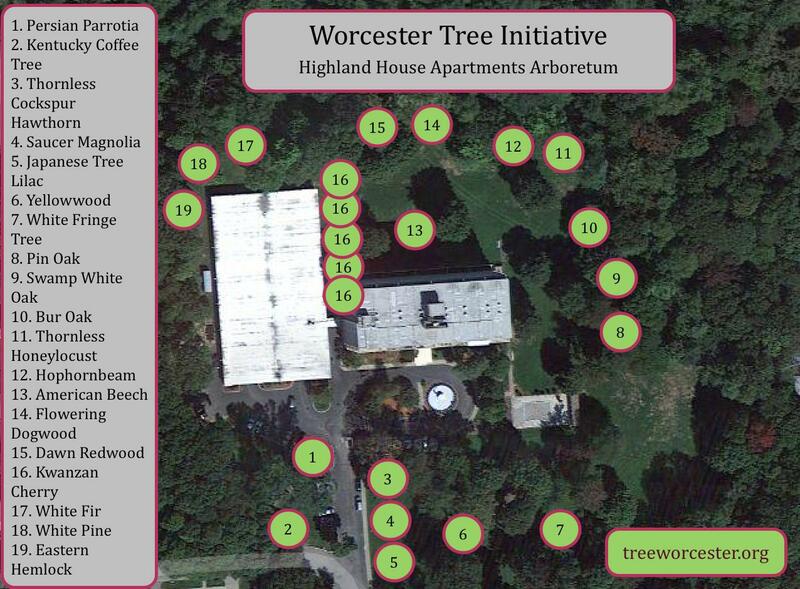 The Worcester Tree initiative has planted 19 different species of trees to create this arboretum throughout the grounds of the Highland House apartments. "This unique and tranquil site within Worcester's largest park was created through a collaborative effort of the Worcester Garden Club and the City of Worcester. Inspired by the devastation caused by the Asian longhorned beetle, the arboretum highlights the importance of incorporating species diversity in landscape design." Dodge Park is one of the places that was hardest hit by ALB. A once forested area, almost all the trees in most of the park were taken down because of the Beetle. WTI helps the Worcester Parks Department with maintenance in the park brining in volunteers and seasonal staff to maintain the trees and trails. Throughout the park you will find a wide variety of trees and shrubs which create a diverse arboretum for the community to walk through and enjoy. Among the trees are a row of apple trees available for picking by the public.